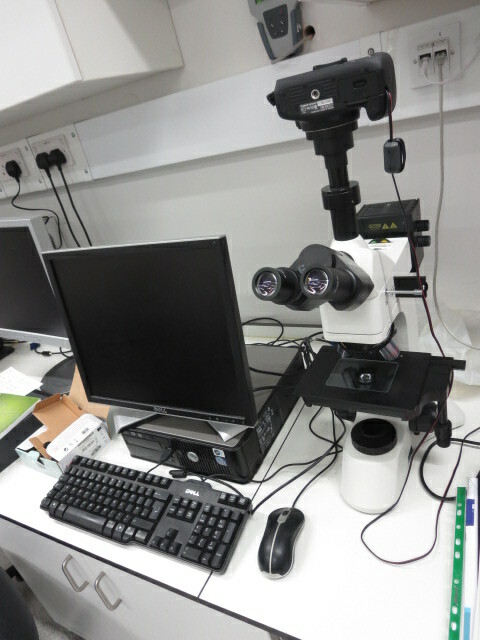 Universal light microscope designed for examination of both opaque and transparent objects. A range of illumination options are available including brightfield, vertical, planachromatic transmitted and incident and darkfield incident illumination systems. The microscope has objective turrets that are equipped with excellent infinity corrected plan objectives (non-coverslip), that are parfocal with spring loaded elements in the x40 and x60 lenses. The large rectangular mechanical stage has long arm drop down controls and a removable glass plate that allows transmitted illumination and also serves as a support for opaque specimens. Within the trinocular head is an analyser filter that can be inserted via a push/pull lever into the optical path for both the transmitted and incident illumination. The analyser is fully rotating via a linkage to an external graduated thumb wheel. The analyser can be removed from the optical path for plain polarised lighting. The trinocular tube can accommodate adapters for digital still cameras.